Winship faculty at last year's ASCO annual meeting. 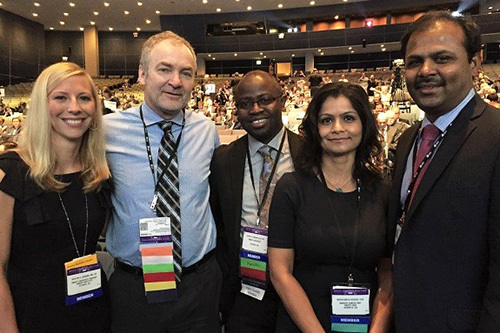 Pictured: Kristin Higgins, MD, Walter J. Curran, Jr., MD, Taofeek Owonikoko, MD, PhD, Madhu Behera, PhD, and Suresh Ramalingam, MD. More than 20 Winship members will present their research in oral platform or poster sessions at the 2017 annual meeting of the American Society of Clinical Oncology (ASCO) June 2- 6 in Chicago. The theme of this year's meeting is "Making a Difference in Cancer Care With You." As senior author of an ECOG-ACRIN (E2511) multicenter study, Taofeek Owonikoko, MD, PhD, Winship medical oncologist specializing in lung and other aerodigestive tract cancers, will deliver an oral presentation of this Phase II study that enrolled patients from more than 40 community and academic sites across the nation. The study evaluates the benefits of veliparib, a PARP inhibitor, for patients with small cell lung cancer. Several Winship members will take part in educational and highlights sessions, including: hematologic oncologist Jonathon Cohen, MD speaking on "Differentiating Between Aggressive and Less Aggressive Mantle Cell Lymphoma" at an education session on Saturday and Field Willingham, MD, a specialist in managing gastrointestinal malignancies, presenting "Hereditary Pancreatic Cancer: Surveillance and Management" on Monday. Nabil Saba, MD, will speak on head and neck cancer for the Highlights of the Day Session III on Tuesday, and Winship Deputy Director Suresh S. Ramalingam, MD will co-chair an oral abstract session on "Lung Cancer – Non-Small Cell Metastatic," on Tuesday. "Winship leaders and investigators will once again present their transformational research at this very important annual cancer research meeting," said Walter J. Curran, Jr., MD Winship's executive director and member of the ASCO Board of Directors. Many Winship investigators will be presenting their research at ASCO's poster sessions. View a complete schedule of all lead author presentations from Winship members. This year, ASCO is featuring a new resource, the Women's Networking Center, that will hold scheduled programs on topics such as "Speaking Up With Confidence," and offers a place for attendees to gather and discuss issues that affect women in oncology. The Center is also offering 30-minute one-on-one mentoring sessions with a host of highly respected women oncologists, including Jane Meisel, MD, Winship medical oncologist specializing in breast cancer. The annual ASCO meeting attracts more than 30,000 oncology professionals from around the world. Abstracts from this year's meeting are available for viewing online.